I like Detroit for many reasons, one of which is its openness. Apart from a little cluster of skyscrapers downtown, there’s plenty of space between buildings so that you never feel suffocated, and you can really appreciate their style. More than 250 Detroit buildings appear on the National Register of Historic Places list, including more than 20 of its grander edifices—the city’s religious structures. Built to last (whether or not they still have active communities), these important buildings keep Detroit beautiful with their various styles and profiles. These are my favorites. I had just finished a wonderful lunch at a restaurant in Greektown, a bastion of Hellenic culture in downtown Detroit, and stopped by a Greek bakery for a treat. As I snacked on some soft apple and honey cookies, I noticed a church tower peeking up over the elevated pedestrian crosswalks above Monroe Avenue. Directly across the street from the modern blue-glass Greektown Casino Hotel stood the definitely not modern St. Mary’s Roman Catholic Church. 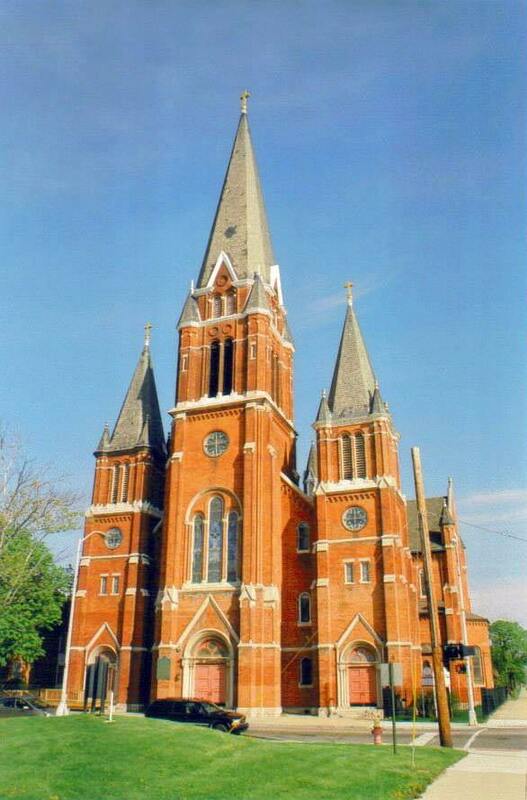 St. Mary’s is the third-oldest Roman Catholic parish in Detroit, founded in 1834 to serve German-speaking immigrants. 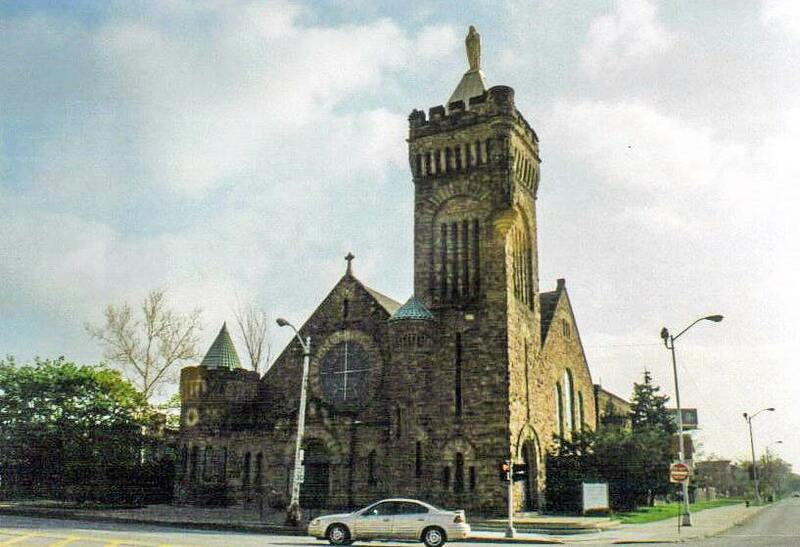 The current structure was completed in 1885 for a mere $81,210.53, designed by an architect who was also a parishioner. Listed as a Michigan Historic Site in 1979, the church remains a key element in the Detroit skyline, particularly its twin towers with striped steeples that I was now gazing up at. The limestone and red-brick church combines Pisan Romanesque and Venetian Renaissance styles in a striking mixture. I passed under the three arches below the rose window with eight quatrefoils surrounding a larger ninth one in the center and entered the church. At 176 feet long and up to 116 feet wide, St. Mary’s can hold a capacity of 1,200 people. Within its magnificent proportions, I admired the 10 polished granite columns separating the nave from the side aisles; the altar statues of Hungary’s patron saints, Stephen and Elizabeth (odd, for a German church now in a Greek enclave); three unusual indoor grottoes; lovely stained-glass windows and Stations of the Cross; the Communion rail with little trefoils, columns, and arches; and the massive organ. Ninety feet above me, colorful cruciform frescoes of Christian symbols run the entire length of the nave. If you’ve just hit it big in the casino across the street, this is the perfect place to give thanks. With plenty of open space surrounding it, it was easy for me to appreciate the beauty of St. Josaphat’s Roman Catholic Church. Named after St. Josaphat Kuntsevych, a Greek Catholic priest who was archbishop of the then-Polish city of Polotsk in the 1600s, the church was constructed in 1901 for the booming Polish population with the employment of local carpenters and a local stained-glass company, which kept the cost down to an impressively low $100,000. 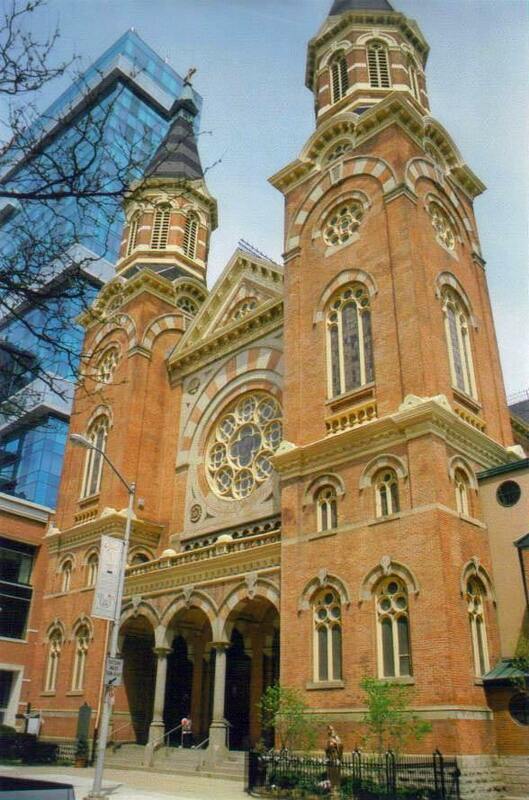 The Victorian Romanesque and Gothic Revival church measures 132 long by 56 feet and can seat 1,100 people. Two identical towers flank the taller central tower, with its wonderful three-panel stained-glass window portraying the Crucifixion and the gray-tiled 200-foot steeple topped by a gold cross. Generous amounts of buff limestone trim the red- and orange-brick façade. Although it faced hard times on the heels of a fleeing population starting in the 1960s, St. Josaphat’s has rebounded with a rehabilitation program that includes a choir and music program and the addition of weekday and Holy Day Masses, including the city’s first regular celebrations of the traditional Latin Mass — initiatives that continue to serve the remaining Polish community and that are bringing worshippers back to the parish, and back inside this magnificent structure. Parishioners and visitors alike enter through one of the entryways in each of the three towers. The church contains five altars, with a painting of St. Josaphat adorning the main altar. White-oak woodwork and stained-glass windows portraying Mary, Joseph, and the Twelve Apostles embellish the interior. Ceiling murals depict the Resurrection of Christ and Our Lady, Queen of Poland. Added to the National Register of Historic Places in 1982 and named a Michigan State Historic Site three years later, St. Josaphat’s has managed to adjust to modern times while maintaining its historical presence. On the side steps of the hulking First Presbyterian Church, under one of the three arches, hung a sign that read, “Keep Off. No Sleeping.” Under the sign lied a homeless man, asleep. Irony? Or just a reflection of Detroit today? Either way, I was a little saddened by the scene, but also by the now familiar story of how Detroit’s churches have suffered. 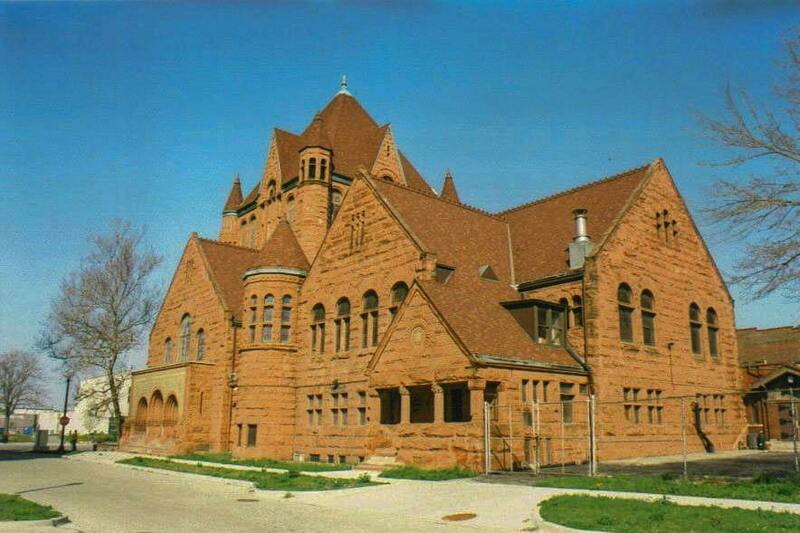 Opened in 1891, this massive, rough-cut red sandstone church housed the oldest Protestant congregation in Michigan. Taking its cues from H.H. Richardson’s Trinity Church in Boston, First Presbyterian features a broad tower with a slate roof and turrets at each corner; lots of gable roofs; and the trio of recessed masonry arches, repositioned to the side of the church in 1936 when the abutting street was widened, and guarded by two lion statues a little worse for wear thanks to rough Michigan weather. The Greek cross floorplan keeps the interior airy and open, with easy viewing of the Tiffany stained-glass windows, including one called “Flames of Fire.” The church prospered for years, until Detroit’s population began to drain. Although added to the National Register of Historic Places in 1979, by the early 1990s, the church was unsustainable and was leased in 1992, evolving into the Ecumenical Theological Seminary. Recently sold to the University of Michigan Credit Union, the church will continue standing, with the seminary still remaining as a tenant, and the building still gracing Woodward Avenue as one of Detroit’s finest. Thanks to its location across the street from empty, virtually treeless Forest Park, the Sweetest Heart of Mary Catholic Church is wide open for unobstructed views. 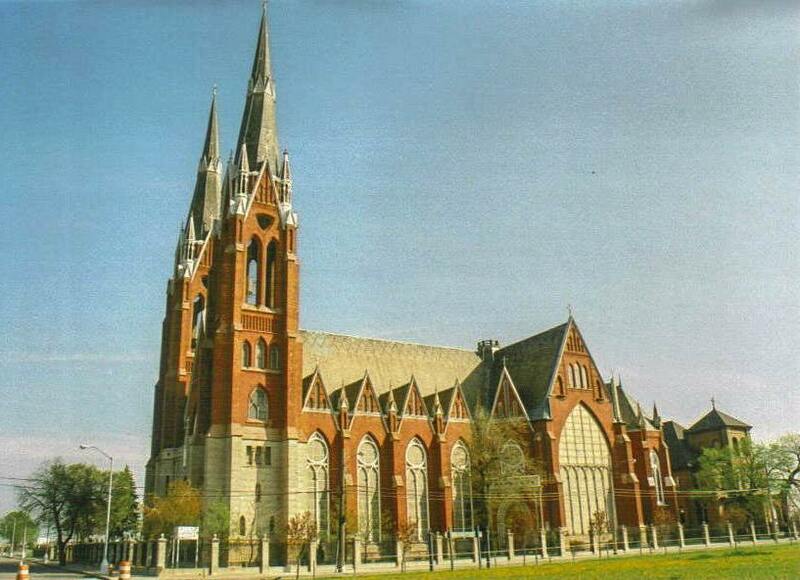 One of the largest Gothic Revival churches in the Midwest (and the largest Roman Catholic church in Detroit), Sweetest Heart rose from an unpleasant and violent division between sects of the city’s Polish population that included lawsuits, factionalization, rioting, a fiery reverend, interference from Rome, and excommunication. Eventually, after spending about $125,000 on its construction, the church opened in 1893 to serve the city’s burgeoning Polish population — 10,000 of whom showed up for the dedication ceremony. The façade at the main entrance sports a rusticated stone base with a triple portal topped by pointed arches. Twin red-brick bell towers top the base, capped by identical spires. An ornamental fence surrounds the entire church. Inside, you’ll find the oldest electro-pneumatic organ in Michigan, and stained-glass windows — including the major transept window that depicts the Holy Family in St. Joseph’s workshop and the eight nave windows portraying Christ, Mary, and saints — that won a major prize at the 1893 World’s Columbian Exposition in Chicago. Inevitably, membership in the flourishing parish waned, beginning in the 1930s and continuing through the 1970s. Facing a bleak future, the church began restoring the building and implementing plans to revive itself. It secured designation as a Michigan State Historic Site in 1974 and was listed on the National Register of Historic Places in 1978. This impressive church deserves a visit not only for its wonderful architecture, but also for its Annual Pierogi Festival, which it has been hosting since 1981. I first noticed Holy Rosary Roman Catholic Church while driving along the sunken Edsel Ford Freeway, its tower rising up above me. I made a mental note to return to see it up close, and was handsomely rewarded when I did. Originally constructed in 1896 as St. Joseph’s Episcopal Church, the building was sold in 1907, switched denominations, and was renamed. Today, it could almost pass as a fortress as much as a church. The Richardsonian Romanesque church, added to the National Register of Historic Places in 1982, is constructed of rugged rock-faced sandstone and features a formidable corner tower with a corbelled and battlemented parapet — an embellishment found on other parts of the church, giving it its imposing presence. A two-story turret softens the corner of the tower, and a gilded statue of the Blessed Virgin Mary atop the hipped roof was added when ownership of the church changed from Episcopalians to Roman Catholics. Opposite it is a smaller conical-roofed round tower, with a band of arched windows. Between them, the main gabled entrance features a large rose window. The interior is open and spacious, devoid of permanent pews. Stained-glass windows line the walls, and the organ pipes radiate out from either side of the rose window in the broad choir loft. More than a century after it was built, this church continues to impress.